Fido loves car rides, right? Head hanging out the window, tongue flapping in the breeze…in fact, he especially loves when he gets to do that while sitting in your lap with his paw on the steering wheel. It’s fine, right? In reality, it’s pretty dangerous for you, for Fido, and for others around you on the road. We want to keep you and Fido safe. Follow our tips below for driving with pets and we can assure you Fido will have fun and you’ll both arrive at your destination safely! First, know the laws for transporting animals. These will vary by location. For example, Minnesota and a handful of New England states have passed laws making it illegal to drive with an unrestrained dog in the car. If you’re planning a trip out of state, make sure to know the law before you go. Second, teach your dog to enjoy car rides. Some dogs may be anxious and even get car sick because of their fear of the car. This is often because their only trips in the car have been to the veterinarian. Take them on some short trips that just result in fun! Trips to the dog park, for a hike, or a swim are great ways to get your dog to see that car rides lead to fun outings. Next, even if your state doesn’t require it, we recommend keeping your pet properly restrained in the car. The dog pictured above has a pet harness. Other options include dividers that allow your pet some room to roam in the backseat but keep him or her from jumping in front with you. 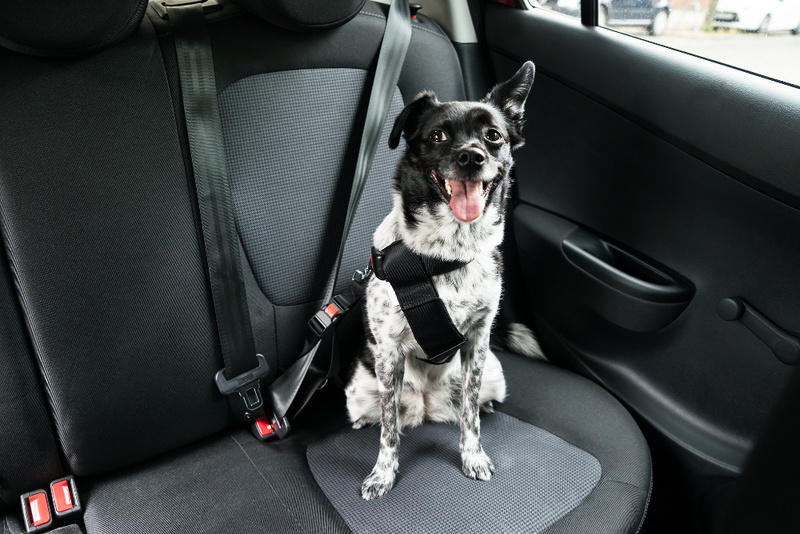 If you come to a sudden stop, your pet needs to be just as protected from that as you are with your own seatbelt. Another option is of course a large crate. This is particularly useful if you’re traveling with cats or small pets. Whatever you do, don’t leave your car alone in a locked car. If it’s winter, the dog could get cold; if it’s summer that car will get hot and your dog can overheat. This is why many states have enacted laws allowing police or sometimes citizens to take whatever means necessary to save a dog from a hot car. For everyone’s best interests, just don’t leave yours alone in a car. If your taking a long trip, there are a few additional tips for driving with pets. Make sure to take long familiar food, water, treats, and a toy or favorite blanket. This will help Fido feel more at home, even when traveling. Make sure your pet is up-to-date on shots and that he or she has good flea and tick protection. Even if they aren’t a big deal where you live, they may be more prolific in the area you’re traveling to. Finally, make sure Fido’s tags are current and that he has been microchipped. We certainly don’t want him getting lost, but if he does, it’s best if all the crucial information is easily available to anyone who might find him. We hope you get to take lots of fun trips with your pets this summer and we hope our tips for driving with pets will help.